Weaves of 1-15% openness maintain your view. 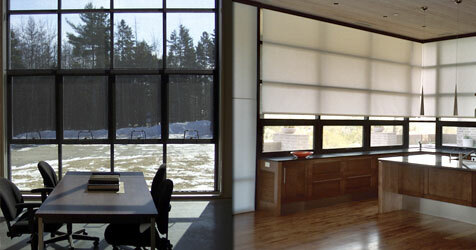 Translucent fabrics ensure privacy and blackout materials are available for complete room darkening. Worldscreen offers a wide variety of excellent shade and blackout materials to fit your interior and exterior décor. These include products from the world’s leading manufacturers, such as Ferrari, Mermét, and Phifer. Shade fabric maintains your view and can reduce air conditioning loads by over 60%, significantly reducing energy consumption and allowing you to maintain a consistent temperature throughout your home. Fabrics may be vinyl-coated mesh, woven fabric, blackout material, or video projection screens. Choose between transparent materials that allow visibility or opaque materials that block light completely and ensure privacy. Fabric choices will impact energy savings. Consult with a Worldscreen dealer to learn more about the best fabric for you.